These dividend yields are generous, but does that make these restaurant stocks a buy? Dividend payments are scarce among restaurant stocks. Cracker Barrel Old Country Store (NASDAQ:CBRL), DineEquity (NYSE:DIN), and Brinker International (NYSE:EAT) might make it onto dividend investors' radar as they all have a rare 3%-plus dividend yield (one of them is currently yielding more than 9%). However, the stocks are down over the last year as some of these businesses have been struggling with widespread pressure on the casual dining segment. Here's what investors should know about these generous payers. Cracker Barrel stock is offering a 3.2% dividend yield as of this writing. The country store and Americana-style cooking chain has an actual payout higher than that when considering the $3.50-per-share special dividend that was paid back in July. That special dividend pushes the annualized yield north of 5%. That's a big payday from any stock, but it's one of the restaurant industry's best. That is in spite of 2017 not being the best of years for Cracker Barrel. The retail side struggled due to changes in the ways consumers shop (read internet shopping and competitor discounting), and foot traffic in the restaurant started to trend negative the last couple of quarters. Those could be worrisome trends, but Cracker Barrel has been handily outperforming its peers even though restaurants overall have been beaten up. Comps in food were up 0.2% in the past 12 months, compared with the industry, which has been averaging declines of greater than 1% since 2016. Company management feels confident, too, recently authorizing another $25 million share repurchase program. Dine Equity, the parent company of Applebee's and IHOP, underwent an overhaul this summer. For good reason, too, as the stock has slowly tumbled to $43 a share from its peak of $110 back in 2015. Total locations in the system have declined to 1,984 compared to 2,013 two years ago, and comparable sales have fallen 8.1% through the first half of 2017. Dine Equity currently pays a hefty 9.5% dividend yield, but that is due to the decline in share price. 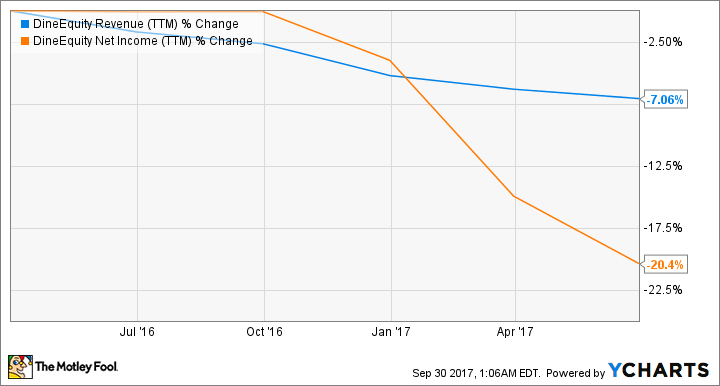 The casual dining chain is in decline, and August was an especially momentous month with the hiring of a new chief marketing officer and new CEO for the whole company, and new chief culinary officer for Applebee's. Quick on the heels of the management shakeup, IHOP unveiled a new lineup of latte-inspired pancake flavors. Applebee's launched a two for $20 deal that includes an appetizer and entrees for two. The hope is that the new menus and focus on value reignites traffic growth. Another exceptional dividend yield at 4.7% is Brinker International, the name behind the Chili's Grill and Bar and Maggiano's Little Italy brands. While faring better than some of its competitors, the casual restaurants have also had struggles. Comparable sales dropped 2.1% during the fiscal year that ended in June. That's on top of a drop of 1.9% during the previous year. 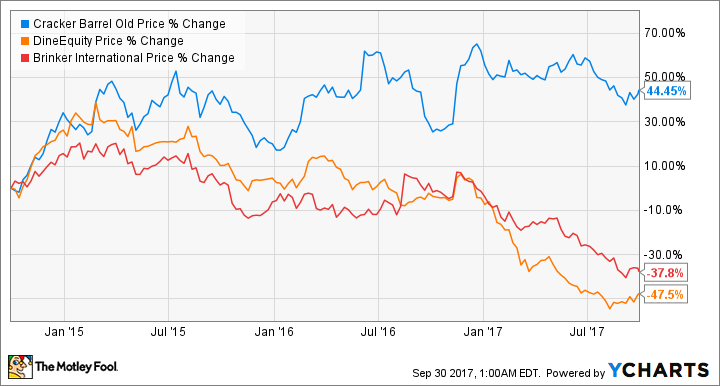 Brinker's high-yielding dividend is also due in part from falling share prices as the chain has failed to beat declining industry trends. 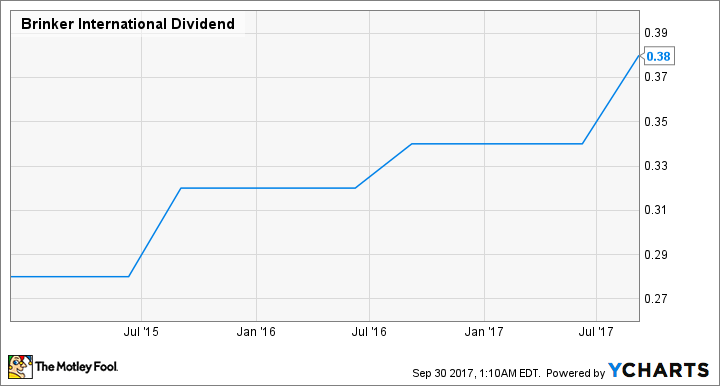 However, part of the reason for the generous paycheck is due to the company hiking its dividend several times in the last few years. To return to growth, Brinker has been doing a menu overhaul. Chili's is slashing 40% of its offerings to refocus on burgers, ribs, and fajitas, though the total item count on the menu is still extensive at 75. Maggiano's recently introduced brunch to its menu, though that brand's changes will have a less meaningful impact on future results. Maggiano's has 52 locations to Chili's 1,622. Unfortunately for Brinker, it's the Chili's name that has been doing the most damage, with fiscal year comparable sales falling 2.1% to Maggiano's only 0.6% slide. While looking for the highest yielders may seem like a winning strategy, be wary of some dividend payers. That yield could be high because it's in peril of going to money heaven. Such could be the case with some of these restaurant stocks. When judging a dividend, I like to look at payout ratio – the dividend paid divided by earnings per share -- and free cash flow trends. *Not including the special dividend. Data source: Yahoo! Finance. Cracker Barrel looks to me like the healthiest stock out of this bunch. 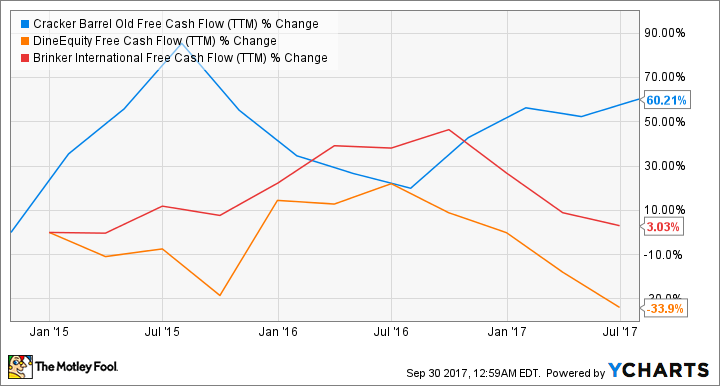 There is a safe margin between profits and the dividend paid, and free cash flow has been the most stable and on the rise. Brinker also has good margin between its payout and earnings, but the declining cash flow could be of concern if it doesn't reverse course. Though the paycheck it currently gives investors looks great, Dine Equity and its dividend could be in real trouble if things don't change soon.